Make a box of instant vanilla pudding as directed. Cut a loaf of pound cake into 1/4 inch thick slices. Arrange half of the slices in a 7 x 11 inch baking dish, then press 20 vanilla wafers into the cake. Make fake tomato sauce: Mix 3/4 cup strawberry jam with 5 crushed Oreo cookies and dollop half of the mixture over the wafers. Sweeten 3/4 cup ricotta cheese with 2 teaspoons sugar; dollop half over the jam. Top with 1 sliced banana and half of the pudding. Repeat with the remaining cake, 20 more wafers, the remaining jam an ricotta mixtures, another sliced banana and the remaining pudding. 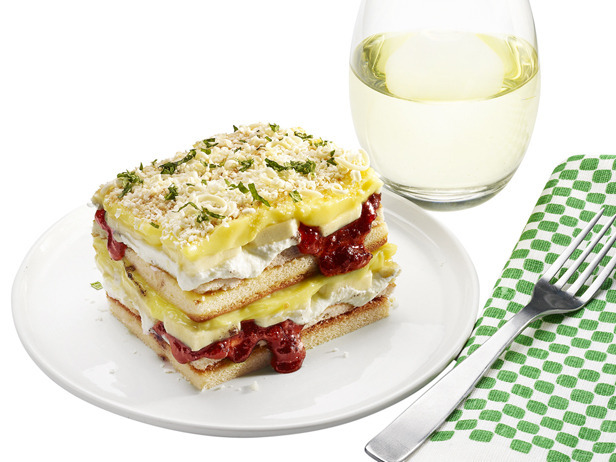 Top with shaved white chocolate, crushed vanilla wafers and minced fresh mint leaves; Chill.